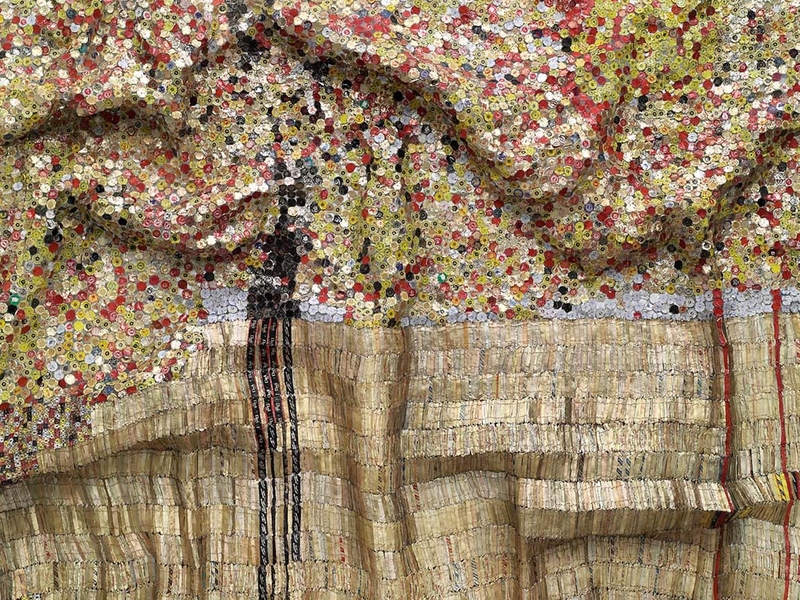 Above: El Anatsui, Black River (detail), 2009. Aluminum, bottle caps, and copper wire. Towles Fund for Contemporary Art, Robert L. Beal, Enid L. Beal and Bruce A. Beal Acquisition Fund, Henry and Lois Foster Contemporary Purchase Fund, Frank B. Bemis Fund, and funds donated by the Vance Wall Foundation. Courtesy of the artist and Jack Shainman Gallery, NY. The works in “Massed Media” are all made using a similar artistic strategy: the massing of multiple components into a cohesive whole—greater than the sum of its parts. Artists have long been interested in gathering or assembling materials in unusual ways to speak about many types of issues. These include how multiplicity and abundance can transform our perception of familiar objects or the interconnectedness and complexity of systems, be they architectural, organic, or human. El Anatsui’s masterful massing of bottle caps and wrappers becomes a political and cultural critique, while the Israeli artist Ayala Serfaty uses clustered strands of glass and fiber to create an otherworldly abstraction. Whether sculpture, video, jewelry, craft, or design, the works in “Massed Media” show the power and potential of pattern.